Uncle Arb was my friend. He was born in Texas, raised in Arizona, then moved back to Texas and that is when we became friends and neighbors. It was the late 1970’s and we were both running yearlings on neighboring outfits. We spent a lot of time looking for cattle that had rimmed out and couldn’t find their way back to water. He was looking for his cattle and I was looking for mine, but the fences were poor and the mountains rough so our cattle mixed often. We had to work together a lot in order to keep them separated and in their respective places. We worked together on different ranches through the years; always enjoying the same things. In the early 1990’s we found ourselves again in the Delaware Mountains tending to yearlings on the same outfit. We did a lot of riding trying to keep up with 1500 head of cattle in the Delaware’s with only one road and a few jeep trails for miles and miles. It was just the way we liked it. One day we had topped out together, not seeing anything disturbing, until we crossed an old jeep trail and saw fresh tire tracks. The only thing more disturbing out in this sort of country would have been space ship tracks. We fell in on top of them and followed the tracks down the rim until we caught up to the alien who was making all the ruckus on our mountain. We rode up on him like a couple of junk yard dogs. We sure wanted to know what he was doing disturbing our day. The feller said he was looking for a spot to put up a meteorology tower in order to test the wind currents as he belonged to a wind energy company and they were looking for a spot to put up some wind-towers. He wasn’t the least bit bashful or uncertain about his plans. The company had heard of the reputation of the wind in the Guadalupe and Delaware Mountains and they thought it would be a wonderful spot for a wind farm. Well, needless to say, Uncle Arb was unimpressed. He leaned over his saddle horn, stuck out his lower jaw and asked the meteorology man real slow if he had ever been up here when the wind was blowing? Mr. Met Tower then replied that he knew all about wind and he had wind towers all over the world. Uncle Arb then replied in a very sharp manner, that he had better take a look around and notice that the limbs on all the trees here on the rim only grew in one direction and that the fence here was put up in the 1920’s and it was a 4 strand barbed wire when they put it up and now it was only a 3 strand and it was all slick wire as all the barbs had blown off! Mr. Wind didn’t even slow up his routine and Arb and I rode off shaking our heads as the boss had given this fella permission to check out his wind farm possibilities. We couldn’t believe someone was going to screw up our mountain with a wind farm for a few bucks. It took a few years to get the towers up and running. It was three months later that they flipped the switch on the windmills. Then we had a winter storm. I was born on January 19, 1945, and exactly fifty years later, a storm blew in on the new wind farm. The wind was clocked at 165 miles an hour just before it blew all the met towers down along with four complete wind generators. Fifteen wheels were gone and the rest of the 100 plus towers were either damaged or shut down. One trailer office was gone and the surrounding mountain looked like the county dumping ground. It kinda chilled the wind enthusiasm, but it didn’t kill it and a couple years later they tried again with a new generation windmill. It wasn’t long before another winter storm hit and shut the new kids down also. They had bought and paid for 600 megawatts of wind but after the second try they decided to let the unused 450 megawatts remain undisturbed; they moved on. Uncle Arb could have saved them a lot money. All they would have had to do was listen to one old cowboy who had spent time looking around. Obra Leo Denton, affectionately known as ‘Uncle Arb’ to all who knew him, passed away on January 18, 2011, he was 90 years old. There are many words that could be said about this veteran cattleman but Mike’s story pretty much says it all. 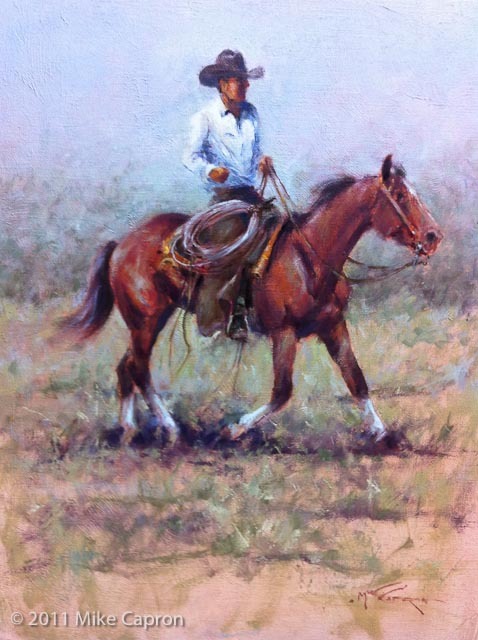 Comments for "My Friend Uncle Arb"
Carol Williamson on February 03, 2011 I remember dancing with Uncle Arb at Jay’s Shell at the base of the Guadalupe Mts ~ He always had his spurs and wild rag on ~ Thanks for the great story Mike ~ Good memories !!! Steve Schneemann on February 03, 2011 Great story about Uncle Arb!! He was diffentlly one hell of a man!!! 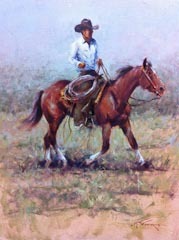 Always thought the world of him even if he wouldnt let me rope on Ol’ Buck!! Haha! he will be missed! Gail Reagan on February 03, 2011 You are a rich man, Michael Wayne. Thanks. Phyllis Gentry on February 21, 2011 Another Great and Entertaining Story. As always my compliments to you Mr. Capron! !